Clarksville, TN – The Austin Peay State University (APSU) men’s tennis team remains on the hunt for its first win, 10:30am, Tuesday, February 5th against Cumberland. The Governors (0-4) have yet to win this season following a promising fall tournament season. The last time out against Chattanooga, the Govs were blanked, but Hunter Sanders was able to take his opponent to three sets. Almantas Ozelis picked up a win at No. 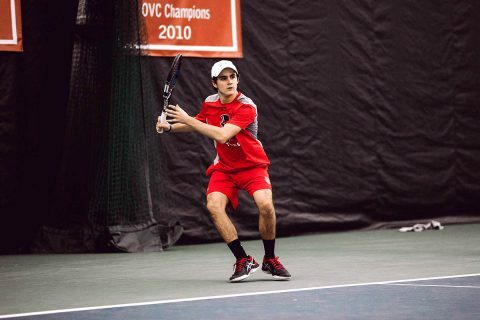 1 singles against Southern Utah, but other than that, the Govs have had a start they will look to put behind them in the next couple of matches. The Phoenix (0-0) open their season on the road against the Govs after a highly successful last calendar year that ended with an appearance in the NAIA National Quarterfinals. The Phoenix return five letter winners from last season’s squad and are ranked eighth in the NAIA Preseason Poll. The last meeting between the two programs came in the 2008-09 season, which the Govs won. Austin Peay State University has additionally won the past six meetings overall.